The Audi R8 supercar is readying itself for a mid-life facelift – and some sneaky photographers have managed to grab some pics while it was testing for the very first time and, my word, it's looking good! While many of the cars cosmetic changes are unfortunately disguised by the annoying camouflage vinyl wrap, it looks like Audi will make some nifty changes to the front grille and vents and also removing the existing car’s vertical slats from the outer gills. While the lights look as if they are unchanged, it’s likely they will see a slight refresh and update on the facelifted car. 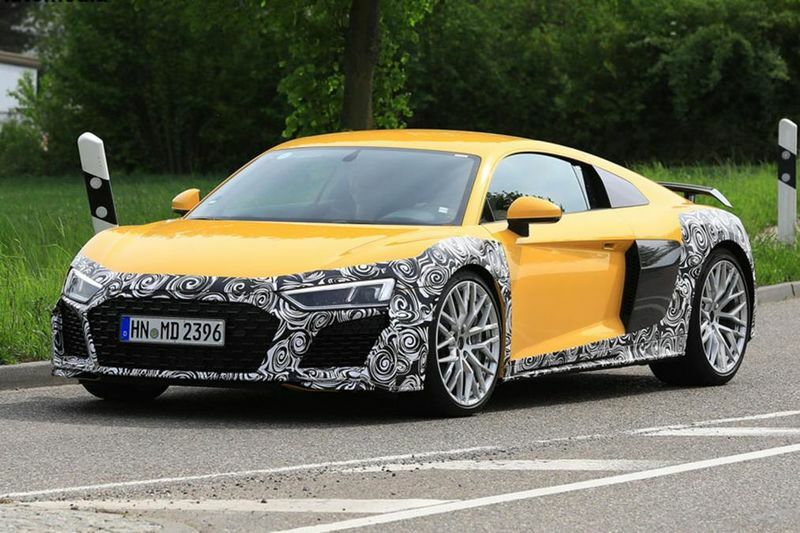 The test car appears to be based on the existing R8 V10 Plus, with the same two-tone side blades and carbon rear spoiler. At the back of the car, the most notable change is the exhaust pipes and tips, which have switched from a rhombus shape to the familiar RS-style oval. On the previous-generation car, this set-up was reserved for V10 cars, suggesting the revised car will keep its high-revving 5.2-litre engine which sounds absolutely mental. However, Audi is expected to expand the facelifted R8 range to offer multiple powertrains. In addition to the naturally-aspirated V10, V8 hybrid and V6 models may also appear which will give a nice range of options for potential buyers to choose from. The six-cylinder version would be carried over from the latest RS 4 and RS 5 models, while the hybridised V8 would provide extra shove via an electrified front axle. This configuration is already used in the Porsche Panamera Turbo S E-Hybrid, producing more than a staggering 670bhp and 850Nm of torque to push you back deep in the seats. Offering two downsized motors would allow Audi to continue selling the R8 in as many global markets as possible, as increasingly stringent emissions regulations take hold in places like China, Japan and Europe. The V8 hybrid would provide a suitable range-topper when the firm is finally forced to kill the V10. However, when the R8 is replaced entirely in the year 2021, there’s a chance it could ditch its thirsty combustion engines completely in favour of an all-electric set-up. This would provide Audi with an EV rival for the plug-in BMW i8, while also complying with future emissions targets. A dead quiet R8 seems like a complete disappointment, but nevertheless, electric vehicles have certainly come along way and will definitely offer some serious advantages, both to the environment as well as the performance it provides as well.